In the championship of the Gregg Anderson Memorial Tournament, Fullerton beat AVC 71-66 to take home the championship on Sunday evening. D’Mauria Jones had 22 points and 9 rebounds and Osinachi Nwachukwu added 16 points in the loss for Antelope Valley (5-5). AVC led in the second half by as much as 12 points but lost concentration on the defensive end and let Fullerton back into the game. Freshman Dee Jones and Osi Nwachukwa carried the scoring and defensive load for the Marauders along with PG Charles Hall who took 4 charges in the game. LANCASTER – Following a 3-pointer from Osinachi Nwachukwu the Antelope Valley College men’s basketball team seemed to be in complete control after taking a 12-point lead with 16 minutes remaining in the championship game of the 65th Gregg Anderson Memorial Tournament. Unfortunately for the Marauders, 16 minutes was just enough time for Fullerton College to mount its comeback. 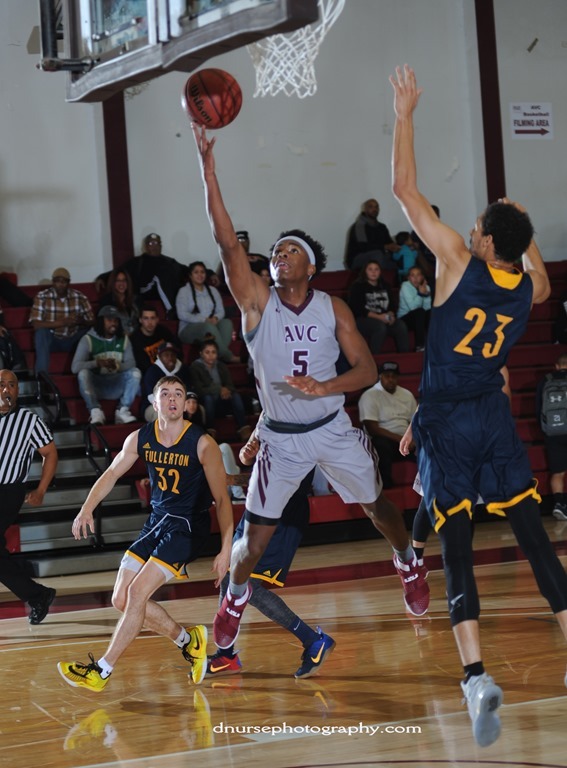 AVC went on a 6-minute drought without a field goal in the second half and the Hornets took complete advantage as they climbed their way back into the game and held on for a 71-66 come-from-behind victory against the Marauders Sunday evening at Marauder Gymnasium. It was Fullerton College’s first championship in the annual tournament, hosted by AVC, since 2005 when it defeated Moorpark College. 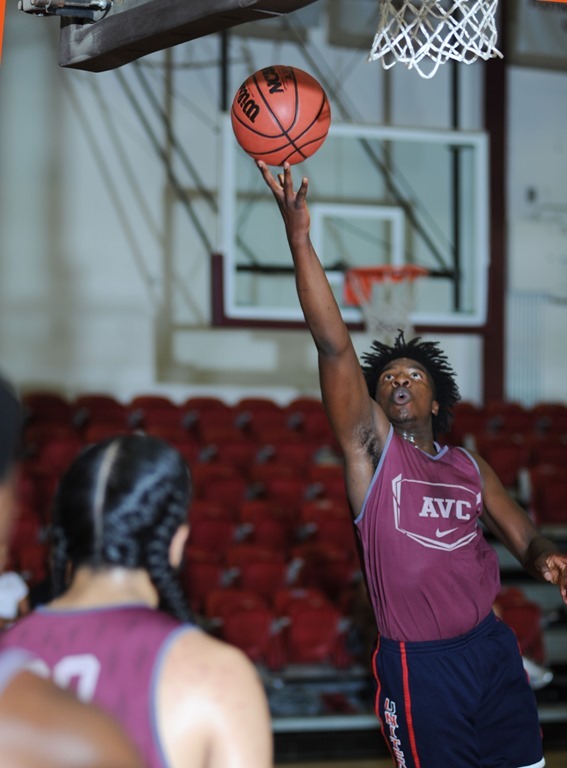 AVC, which captured the tournament title last season by defeating San Bernardino Valley College, has not won back-to-back tournament titles since 1967-1968. "I thought in the first half we weren’t playing that great, but we were hanging tough," AVC head coach John Taylor said. "I thought for about 28 minutes we played really good basketball, but for that other 12 minutes we played so poorly and we still had a chance to win. When you start playing marquee teams you can’t take off possessions." The Marauders (5-5) led 32-30 at halftime and opened the first four minutes of the second half on a 13-3 run following Nwachukwu’s 3-pointer, giving them a 45-33 lead. AVC led 48-38, but tournament MVP Nick Anderson drilled a 3-pointer and was fouled. Anderson’s free throw conversion trimmed the lead to only 48-42. That gave the 13th ranked Hornets (7-2), which knocked off the state’s top ranked team San Bernardino on Saturday night, much needed momentum. Later in the half as the Marauders struggled shooting the ball, Fullerton scored five consecutive points, which included a stretch in which AVC turned the ball over on four consecutive possessions, and took its first lead of the game since 2:15 remaining in the first half. That capped a 20-7 run by the Hornets. From then on, the Marauders continued to struggle. Fullerton’s Ian Fox connected on a deep 3-pointer which gave his team its largest lead of the game, 64-54, with 5:46 left. "In the first half we were executing and in the second half we started playing their game," said Nwachukwu, who finished with 16 points on an efficient 7-of-9 shooting. "We started paying attention to the score and then we started doing our own thing. We just have to keep playing like we don’t have the lead. This is a learning experience for us and a stepping stone." AVC used a 10-3 run of its own later in the half and a bucket by D’Mauria Jones cut the Hornets lead to 67-64 with just under three minutes remaining. The Marauders trailed 70-66 with 38 seconds left and forced Fullerton to commit a turnover, getting the ball back. However, a 3-point attempt by Cory Dollarhide missed and Fullerton was able to preserve the victory. "We lost focus out there," said Jones, who finished with 22 points and nine rebounds and was named to the All-Tourney team. "We were supposed to keep after them. It’s disappointing, but we have to let this one go. I thought for 28 minutes we played excellent basketball." The Hornets took a 23-15 lead late in the first half, but the Marauders were able to chip away at that lead. With the help of an acrobatic shot by Jones which turned into the old fashioned 3-point play, AVC tied the score, 25-25, with a little more than two minutes remaining. A 3-pointer by Reggie Byers gave AVC its first lead since early in the first half at 28-26. The Marauders led at halftime 32-30. They were able to hold onto that lead for the first 10 minutes of the second half until Fullerton mounted its comeback. "If you think about it we’ve won 80 percent of our last five games (after a 1-4 start)," Taylor said. "I thought we gave them some easy baskets. These types of games can only help us. These are the teams we want to play."